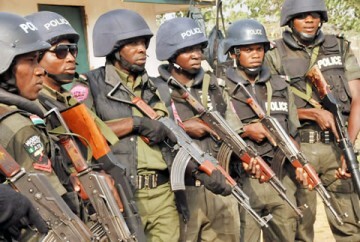 The Police High Command in Abuja, yesterday, confirmed the death of 38 Police officers in Monday and Tuesday’s attacks on Damaturu and Maiduguri by Boko Haram terrorists. The terrorists had stormed the cities, with police stations and other security agencies apparently their targets. More than 150 persons, including two medical doctors, a staff of the Federal Polytechnic, Damaturu and his two children were also killed during the attacks, according to a rescue official and a health worker who spoke to AFP. According to him, most of the policemen killed were at the Mobile Police base in the Gujba Road area of Damaturu. A senior rescue official and a medical source at Sani Abacha Specialist Hospital, Damaturu told Vanguard that 115 bodies were brought to the morgue after Monday’s attack, although it was not clear whether they were insurgents or civilians. “All 115 were in civilian clothing, but it was not certain whether they were all non-combatants and among the dead were two medical doctors, a staff member of the federal polytechnic in the Yobe State capital, and his two children. Six soldiers were also killed”, the sources added.